The Cave Rescue Organisation collection consists of the early administration records dating from 1934 to 1965, and a copy of the Incident Log from 1935 to 1964. The material was passed to the British Cave Research Association by the CRO, and it is now held in the National Geological Repository at BGS Keyworth for safekeeping. Jack Pickup had the foresight to photograph the material before it was transferred, and those photographs are available for viewing on the BCRA Online Archive. The CRO was the first rescue organisation of its type. It was formed in 1935 following an incident in Gingling Pot in October 1934 when a member of the Moor and Fell Club fell and broke his leg. He was successfully rescued after spending 29 hours underground, but shortly afterwards a meeting was convened in Norman Thornber's house to discuss the establishment of a rescue corps to handle future incidents. It was attended by representatives of half a dozen senior clubs, and chaired by E.E. 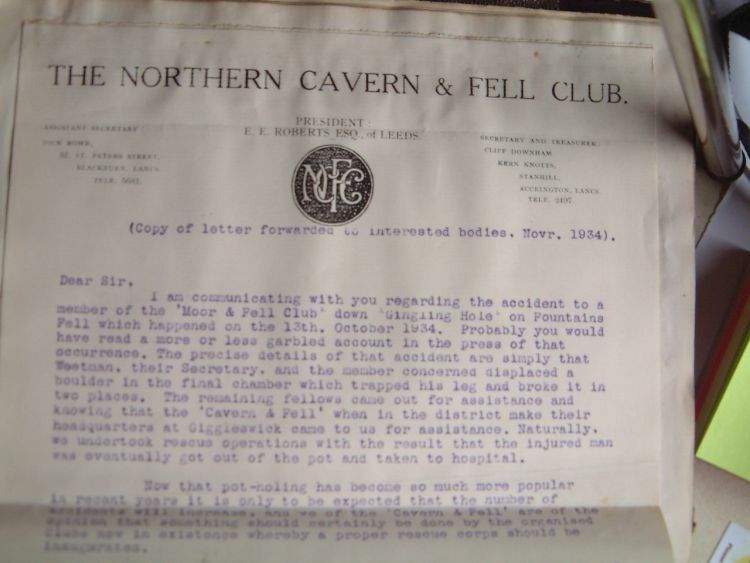 Roberts, President of the Northen Cavern and Fell Club and a long-standing member of the Yorkshire Ramblers Club. As a result the Central Rescue Organisation was established with Norman Thornber, Reg Hainsworth, and Godfrey Wilson being appointed the first wardens. It changed its name to the Cave Rescue Organisation in 1938. The first part of the collection includes all the material from this period. The early history of the CRO is well documented in the book "Race Against Time" by Jim Eyre and John Frankland. The Incident Log records all the incidents attended by the CRO from its inception to 1965. It's a non-contemporaneous summary of the incidents, probably compiled by Brian Boardman. A catalogue entry for the material may be found on the British Geological Survey website, and you can arrange with the BGS to view it.